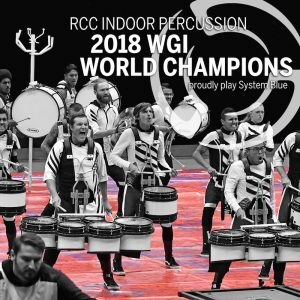 Congratulations to RCC Indoor Percussion for winning the gold medal and becoming the 2018 WGI World Champions. RCC’s show, LISTEN, explored the progress of life, love and art, through the poignant poetry of Charlie Schmidt. RCC performs on System Blue Professional Marching Battery, tuned percussion, drum set, concert toms, and concert bass drums. They won the World Championship with a score of 97.863.